It’s gotta be good to be Apple. They’re the corporation everyone loves; the mascot of American ingenuity. Are we surprised that the same ingenuity that brought us the Mac and the iPhone would also uncover perfectly legal and totally awesome corporate tax breaks? The NPR journalist who reported today on the Senate hearings took an interesting approach. The teaser was “Is Apple pulling shenanigans with corporate taxes?” Shenanigans? That adorable little imp of a corporation. They are just always up to something darling aren’t they? Senator: Mr. Cook, you are really cool. What are you crazy kids at Apple cooking up these days? Cook: I would love to see pictures of your grandkids! Cook: We’ve done nothing illegal; we just take advantage of corporate tax loopholes like every other corporation in America. Senator: It’s all very clear now and I think we’ve heard enough. Apple is so cool! 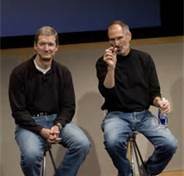 I can’t believe you hung out with Steve Jobs. I mean, wow, right? Senator: We will schedule hearings immediately! We must make an example out of Microsoft, in Steve’s honor. It’s good to be Apple. This entry was posted in Uncategorized and tagged Business, Celebrity, Culture, Irreverent, Politics. Bookmark the permalink. When I read articles detailing the lengths American Corporations will go to in avoidance of paying taxes, I flash back to my Marxist youth at University of California. Apparently overseas tax havens are the height of patriotism, but advocate raising the top marginal rate to 39% on high earners, and suddenly you’re a “socialist”….. or is that just a little too blatantly political? I grew up in Washington, DC so nothing is too blatantly political for me. When I went to business school a gazillion years ago it was drilled into our heads that the job of a corporation is to maximize profits, at any cost as long as it was legal. And that is still a corporation’s overriding responsibility-I really don’t blame them for taking advantage of built-in loopholes. Where did we go wrong? Our ethics discussions at the time were mostly fixated on the FCPA–no bribing of officials in other countries even if that’s how they did business in their culture. I guess bribery in our country is OK…isn’t that what lobbyists do? Someone is going to have to have deeper pockets than the NRA if they want Congress to pass gun control laws. Politics was never supposed to be a career. Put a two term limit on Senators and a 3 term limit on Reps, and reform campaign finance, and maybe they would do their jobs instead of worrying about who is financing their next campaign. And by the way, if corporations were run like Congress, they would go out of business. In my entire career I don’t remember an occasion when it was OK to stomp my foot and cross my arms and refuse to work with someone on the other side of the table just because he or she had different ideas. The last time that worked for me was in 3rd grade. OK–you see it doesn’t take much to get me on a rant. I think I hear fifes playing in the background (remember Green Acres?). OMG! Hysterical (except it may be closer to the truth than we think). You do great conversations.